The 1906 earthquake destroyed much of Santa Rosa’s 19th century heritage — and also its chances for a remarkable architectural future. Santa Rosa was not a town that welcomed architects; many of the fine pre-earthquake houses that still can be seen around town were built sans architectural plans by local contractor Frank Sullivan, and before him, T.J. Ludwig. Even architect Brainerd Jones from nearby Petaluma found little work here; besides Comstock House, he designed only four other Santa Rosa homes and three public buildings during his nearly half-century career. When locals did realize that they needed the services of an architect to build something nice, they went to prestigious big city firms. San Francisco architects drew up plans for the lodge halls, post-quake courthouse, city hall, and high school. It wasn’t until the 1930s and construction of the Junior College that a hometown architect, William Herbert Cal Caulkins, was able to establish an architect’s beach head. But in the months before the quake, Santa Rosa had a resident world-class architect who seemed itching to transform Santa Rosa, and the town seemed willing to let him do it. His name was William H. Willcox. It’s unknown exactly when Willcox arrived in Santa Rosa, but the early 1906 newspapers were full of him. Once he unveiled his plans for a convention auditorium that could host more people than any other building ever built in the town, he was the darling of Santa Rosa’s business elite. At a Feb. 1 city hall meeting, $2,800 was pledged on the spot; by a month later, $8,000 had been promised towards construction, and in just a few more weeks — say, by mid-April — the subscription goal of 10 thousand dollars surely would have been reached. But his Mission Style pavilion, seen here in a Press Democrat illustration, was not his greatest ambition. Willcox proposed to redesign Santa Rosa itself; he wanted to dam Santa Rosa Creek and turn it into an urban lake that would be the centerpiece of the town. Gone would be the blighted red-light district along First Street. From the E St. bridge (for which he also proposed a new boulevard design) to beyond Santa Rosa Avenue, the inviting waterpark would have electric lights, paths and benches, a swimming pool, a section between the bridges over one hundred feet wide for water sports, and a kiosk jutting over the water for bands to entertain. But like his pavilion, his waterpark plans were forgotten after the earthquake. Willcox is a cipher. As far as I can tell, there’s no scholarly overview of his career or even a reasonably complete catalog of his work. He knocked around the country for more than thirty years, picking up commissions for churches, libraries, mansion-like homes, and state buildings. Besides Santa Rosa, he had offices in New York, Chicago, St. Paul, Seattle, Los Angeles, San Francisco, and probably other places unknown. Today William Willcox is identified as a progressive architect who helped define the American “Queen Anne” style in the 1880s. (He was also famous as the Civil War mapmaker whose pen portrayed the famous battlefield of Antietam.) Several Willcox buildings are on the National Historic Register, and his work in St. Paul is particularly well known — see pictures of the Kellogg House and the Driscoll House. His grandest project was the Nebraska State House, which took three years to build and cost over $1.25 million in the early 1880s. Not that he designed only extravagant; in an 1883 house pattern book he presented a novel design for an octagonal cottage, arguing that it was a superior value. Willcox lived a decade more, dying at age 96 the Veteran’s Home in Yountville, where he is buried. In local history, he has only a small footnote as being the guy who decided whether a quake damaged building was safe. Had he arrived a year earlier, or the quake struck a year later, his name might have been immortalized as the architect who transformed Santa Rosa into something of wonder. The proposal before the meeting held at the City Hall last evening when the plans were being considered, for the coming of the great party conventions this summer, for the erection of a pavilion suitable for the use of the conventions while in session, prompted the Republican to interview P. H. Quinn relative to some of the facts about the large pavilion which was erected in Eureka some several years ago. The building is just such a structure as it is proposed to have here, and is such that after the conventions have been held, it would be of real benefit to the community, and would be in demand for many gatherings during all seasons. 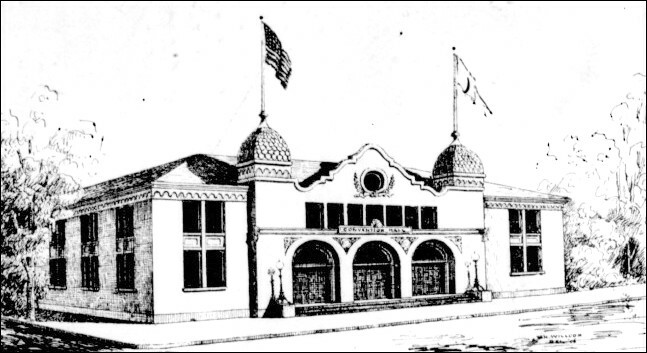 Mr. Quinn states that the Eureka Pavilion is built very much on the plan of the State Fair building at Sacramento, and that it is merely a shell well covered on the outside with good weather boarding and a good roof, while on the inside it is ceiled, and has a very fine floor so that it could be serviceable for fairs, dances, or skating–in fact anything in the amusement line. He states that the building there has always been in demand and rents for a good sum–the amount of which he has forgotten–and that it has been a paying proposition from the start. When the plan was first broached, it was decided to build it as a joint stock concern, and the Occidental Mill Company, which is a large firm in Eureka, was interviewed and agreed to furnish the lumber for the structure and take stock in the company for the same. He suggested that some good reliable party could go from here to some of the great milling companies in the north and interest them in the move here, to furnish the material at a very nominal cost, and thus get a good building at a much less price. The Eureka building is so constructed that there are two wings and they can be thrown into the main building thus enlarging the auditorium, and beside, there are galleries all around the room and these afford an immense seating capacity. Mr. Quinn is very much interest [sic] in the movement that has been started here, and is of the impression that the erection of such a pavilion as is proposed will be of inestimable value to Santa Rosa, and would be in demand all the time. As in all probability we shall soon have a noble new stone bridge spanning Santa Rosa Creek at E street, let us consider what shall be done toward the betterment of the creek, in at least the portion that meanders through the city. For years the condition of this stream and its bed has been a menace to the health of our city, and inexcusably, I think, for the opportunities which exist toward raising it to a sanitary condition and making it an exceedingly beautiful body of water has been lost sight of in a perfectly lackadaisical spirit. The people of Santa Rosa have really a great opportunity within their precincts, in this hitherto neglected stream. Tracts of ground that are too rough and precipitous to be conveniently built upon are quite suitable for parkage and may generally be devoted to such purposes with excellent results. Our city has all the topographical character that it deserves, and it may easily and economically emphasize and dignify the great value of its stream. The ground on either side is difficult to utilize for any other purpose than that of parking, and conversion into a pleasure ground will eliminate its present unsightly and unhygenic character. Indeed all the elements of what may be termed natural beauty, that is, a landscape characterized by simple and flowing lines, exist; the raw material of forest trees, running water, undulating surface and meandering shore, may be readily appropriated with great effect and so little cost that picturesqueness may be easily obtained. The banks and shelving reaches are now encircles [sic] by many find specimens of foliage, which only need a little cleaning out and trimming. The shrubs and trees are there. With the spell of wildness unbroken the landscape is brimming with natural beauty. Now let us consider how we may improve this long neglected and despised spot. Nothing is more delightful than pure clean running water: it is the life of a landscape; the delightful and captivating effect of water in scenery of any description are universally conceded. Its effect is almost magical, and with the blue of a Santa Rosa sky, and its silvery clouds, and the deep verdure of the foliage reflected upon it bosom, which feature could be more delightful or responsive. Now by damming the lower part of the stream at some convenient point just east of the gas company’s plant with a head of water of greater or less height, the water may be thrown back as desired, and as it is always running clear and pure from the mountains, a constant level will result, sufficient in quantity to maintain at all times an overflow, thus, the stream may partake of the character of a river instead of a creek, developing into an [sic] dignified expanse of water. Owing to its varied contours and meanders, the shore at some places will steal gently and gradually away from the level of the water, while at others it will rise suddenly and abruptly into banks more or less steep, irregular and rugged. Upon portions of its banks various kinds of wild ferns may be so planted as partially to conceal and overrun and hide rip-rap work or rocks and stumps of trees, while trailing plants will still farther increase the intricacy and richness of such portions. The Virginia creeper, Woodbine or Honeysuckle and other beautiful vines may be planted at the roots of the trees and left to clamber up their branches; and the wild clamatis so placed that its luxuriant festoons shall hang gracefully from the projecting boughs of some of the overarching trees, diffusing a delicious breath and making the walk beneath doubly delightful; while lovely wild flowers, peeping in and out, would yield gaiety and brightness to the parkage which the trees alone could not impart. Leading from D street and either end of E street bridge, let us maintain walks through the more pleasing portions of the grounds, commanding now and again charming ranges of water scenery, and exhibiting at every portion some new feature, some changed aspect on which one’s thoughts dwell with delight. Let us conduct the pathways, through portions varied in character, and in graceful and pleasing lines, every advantage being taken of the natural contour of the ground. The winding walks, open bits of grassy levels or slopes, shrubs grouped naturally on turf, shady bowers and rustic seats, all agreeably combined, would render these grounds very interesting, instructive, and attractive. Some of these walks might terminate at neatly thatched structures of rustic work with seats for repose and views of the landscape beyond; along the margins of the pathways, where they would be appropriate and in harmony with the scene, might be laced rustic seats. Other embellishments of interest, such as arbors, vases and plant baskets of different forms, but in keeping with the spirit of the scenery, might be introduced. The boundaries, on all sides, should be irregularly planted, so that formality will be scarcely perceived, except within. The view from the E street bridge would include a view of all of the principal features. At the foot of D street and on its axial line, and observable from the present postoffice on Fourth street. I would suggest the construction of a neat and simple kiosk; in properly riprapping at the base of the kiosk and on the line of First street, a concourse may be provided to accommodate a great number of people. This kiosk could be used for orchestral purposes, and the rip-rap work, falling away toward the stream, its surface covered with the garniture of ivy, Cherokee rose or other charming creeper, luxuriant and spendid would be the result. At both approaches to the E street bridge, along the lines of First street from D to Main streets, and along the approach to Main street bridge, commodious esplanades might be maintained affording uninterrupted water and park views, very agreeable in character. A convenient place for a dam is to be found just east of the gas works. This dam need not be constructed higher than nine feet, and as the fall is a trifle in excess of five feet from the E street bridge to the bridge at Main street, nearly four feet of water would be constant under the E street structure, and at that place expanding to a width of over one hundred feet, large enough to play water polo and important enough for Venetian sports. East of the dam a public swimming pool of large dimensions, enclosed along simple and economical lines, but unroofed, could be constructed, with a pleasing entrance way bordered with shrubs, from Main street near the bridge. The water in the pool would be always clear because always [sic] running. At a point just east of the turn which the river makes before it mixes with the water of Matanzas Creek, and running eastward to the turn of the water west of the railroad bridge, in a gently curving channel line, a stretch of just one half mile is obtained, that would be available for boat racing and other aquatic sports. At some convenient place undoubtedly a boat house would be build and the people of Santa Rosa could amuse themselves in rowing upon the face of a beautiful and healthful river, that is now given over to the deposition of old tinware, offal, and all sorts of baneful deposits and nuisances that at times render the air fetid and dangerous to health by diffusing its deleterious and poisonous gases through the city.